Developed in the fifties & sixties, this sweet semi-urban community is located 5 miles from downtown Austin, tucked between MoPac and Highway 71. Most people recognize the Westgate neighborhood from the always-bustling Central Market grocery and shopping center. Prior to the development of The Westgate Shopping Center which was developed in the early 90’s, Westgate was predominately residential, consisting of mostly ranch style and 2-story homes with larger lawns and those giant old trees South Austin loves. Today, the Westgate neighborhood has “all of the above,” plus new architecture and all the urban comforts that residents need to feel comfortable and progressive. Westgate is also one of the few neighborhoods left close to downtown that middle-income households can easily afford. 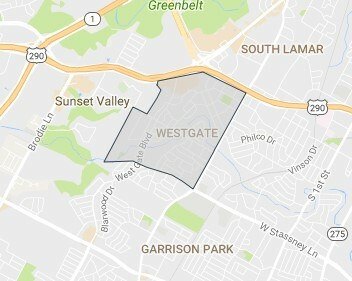 Compromised of a culturally diverse population and a wonderful mix of families, singles, and couples, Westgate is a great place to settle down and enjoy big amenities in a safe little neighborhood. In case you hadn’t noticed, us Austinites are big fans of anything that involves giant water slides, indoor skydiving, and great big actrivities of any kind… ESPECIALLY when the whole family can play together! The Altitude Trampoline Park is a new addition to Austin’s Westgate community, opening in the summer of 2016. Here’s the low-down: It will be crowded. It doesn’t open until 1pm on Sundays. It’s not inexpensive, but it’s a complete bargain because you get (drumroll please) dodgeball, basketball, foam pits, climbing walls, and ofcourse… trampolines! With all those areas to play for all different levels of jump – both child and adult – you really can’t beat it. And finally, their concessions are very good, and they provide gluten free, sugar free, and chocolate free snacks!